Apple cider vinegar --- 3/4 qt. Horseradish, grated --- 2 Tbsp. Metal skewers --- 12 ea. In a large bowl, combine diced chicken and rotisserie seasoning; shake off any excess seasoning. 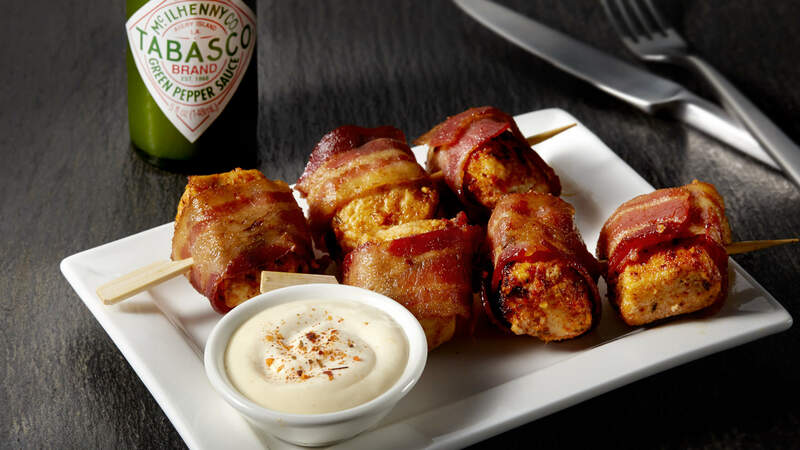 Wrap each piece of chicken in a strip of bacon. Place 4 on each skewer. Combine the rest of the ingredients to make barbecue sauce; set aside. Place skewers on a rotisserie and cook until done. Serve with a side of barbecue sauce.